What Day Of The Week Is September 8? 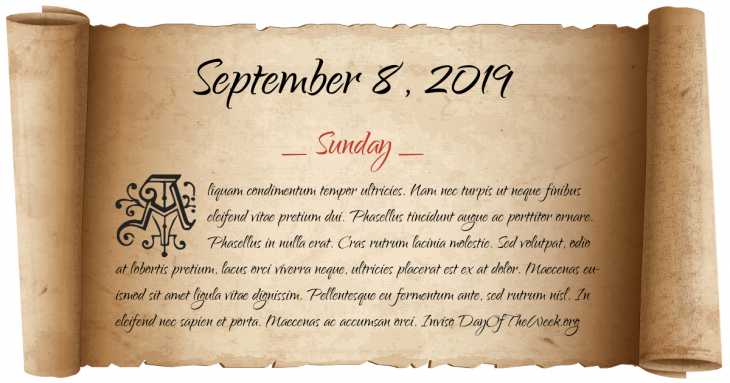 September 8, 2019 is the 251st day of the year 2019 in the Gregorian calendar. There are 114 days remaining until the end of the year. The day of the week is Sunday. Battle of Tumu Fortress – Mongolians capture the Chinese emperor. Michelangelo’s David is unveiled in Florence. French Revolutionary Wars: Battle of Bassano – French forces defeat Austrian troops at Bassano del Grappa. American Civil War: Second Battle of Sabine Pass – on the Texas-Louisiana border at the mouth of the Sabine River, a small Confederate force thwarts a Union invasion of Texas. The Pledge of Allegiance is first recited. US Senator from Louisiana, Huey Long, nicknamed “Kingfish”, is fatally shot in the Louisiana capitol building. The Canadian Broadcasting Corporation makes its first televised broadcast on the second escape of the Boyd Gang. In Washington, D.C., the John F. Kennedy Center for the Performing Arts is inaugurated, with the opening feature being the premiere of Leonard Bernstein’s Mass. Watergate Scandal: US President Gerald Ford pardons former President Richard Nixon for any crimes Nixon may have committed while in office. Who were born on September 8?